Rates include: 100 units of electricity per day, WIFI, free water usage, daily maid cleaning, onsite-maid available 24/7. The first impression of Na Jomtien Emerald Sunset Villa will astound you. With an absolute beachfront location on Na Jomtien Beach, this seven-bedroom villa is a fantasy come true. 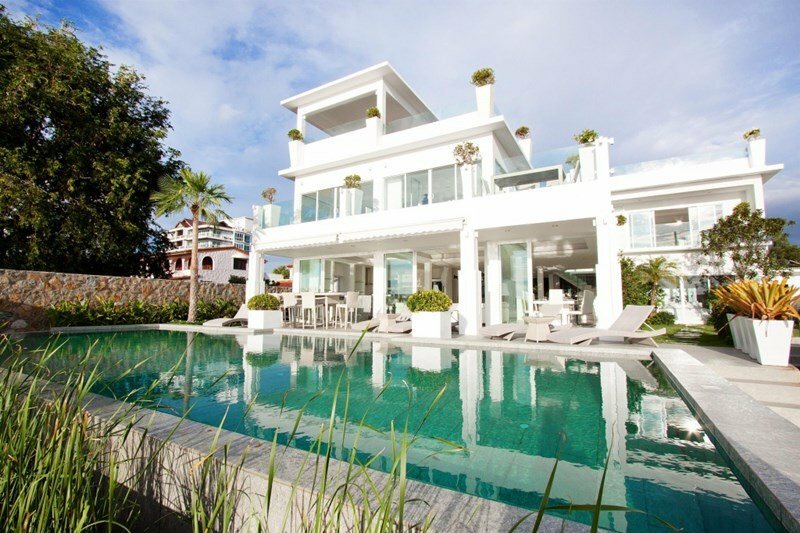 This villa raises the bar for all contemporary luxury villas in Pattaya. You can feel the sand between your toes when you enter the back garden with its landscaped lawns next to a private infinity swimming pool and an adjoining terrace with loungers and outdoor dining area looking over the Gulf of Thailand. From every part of the house, the beach and sea views command your gaze. The open-plan living space is decorated in light shades, creating that luxurious, contemporary style that permeates every part of the villa. Set over two floors, you will find the lounge, and expansive western-style kitchen, dining area and three bedrooms on the lower level. Floor-to-ceiling windows encase the ground floor allowing copious amounts of natural light to brighten the environment. On the upper floor there are four more bedrooms, three of which have sea-view balconies. The most stunning feature of Na Jomtien Emerald Sunset Villa is the expansive roof-top terrace. The sea and beach views from this elevated position will take your breath away. The terrace has a large covered dining sala with lots of seating areas, perfect for entertaining and relaxing while taking in the sunset or hosting a BBQ or party. With an absolute beachfront location, the villa is situated directly on Na Jomtien Beach. Because this beach is off the major tourist track, you can still find some great spots to relax. Jomtien Beach, which is one of the most popular holiday places in the region, is just over 5km away from the villa. There you will find a vast selection of restaurants and nightlife options. At the end of the street on Sukhumvit Road, you will find convenience stores and local Thai restaurants. Phoenix Golf Club is under a 10-minute drive from the villa. A drive into Pattaya will take approximately 15 minutes by car. If you are seeking the ultimate relaxing beachfront atmosphere that is still close to the region’s main attractions, this is the one for you. There are seven bedrooms in Emerald Sunset Villa, six of which integrate the spa-like en-suite bath area into the room designs. All seven bedrooms have double beds, air-conditioning and flat-screen TVs with international channels. Three bedrooms are situated on the ground floor with a four more upstairs. Three of the upstairs bedrooms have their own sea-view balconies. The bedrooms sleep 14 people in total. There are eight bathrooms in total. Seven of the bathrooms are ensuite, with the remaining bathroom located on the roof-terrace. All the bathrooms have showers, toilets and wash basins, although 6 of the ensuite bathrooms are part of the bedrooms themselves. The kitchen is part of the open-plan living space and is extremely modern in design, built to the highest Western standards possible. With beautiful marble work surfaces and a breakfast bar, the kitchen is home to appliances that include a Smeg oven and dishwasher, microwave, double-door fridge, an electric grill, coffee maker, toaster and a four-ring electric hob. Surrounded by floor-to-ceiling windows that open up to the terrace and pool, the minimalist lounge has two conversation areas that have sofas and chairs for 15 people. Here you will find a pool table and a wall-mounted LG flat-screen TV with international satellite channels. Every part of the lounge is dominated by those picturesque sea-views. You have lots of options for dining in Na Jomtien Beachfront Villa. The main dining area is in the open plan living space and comes equipped with a 10-seat glass dining table. Outside on the pool terrace there is a table and chairs for 8 people. For something a bit more relaxed, there is a modern Thai sala on the roof-terrace with comfortable seating for several people looking out across the Gulf of Thailand. The roof-terrace also features a bar area and a BBQ unit.